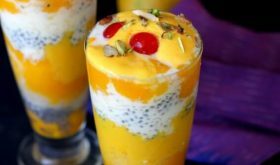 Mango falooda recipe is one of the easiest chilled Indian desserts one can whip up during the hot summer season when mangoes are available in abundance. It is a chilled dessert beverage with incredible flavor, texture and color. The authentic or traditional falooda which has its origins in Persia calls for the use of rose syrup, falooda sev or thin vermicelli noodles, basil or tukmaria seeds and chopped nuts. You can play around with the flavors by using mango, paan, banana, pineapple, saffron or kesar, strawberry, mixed fruits or chocolate. 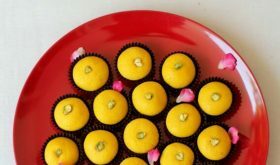 It’s the mango season and I have a lot fresh mango puree that I am putting to use in chilled desserts like eggless mango pudding and mango sago pudding Indian sweets like mango sandesh and mango phirni. Last week, I made mango falooda on a hot sultry day. Relishing on this chilled dessert was like manna from heaven. 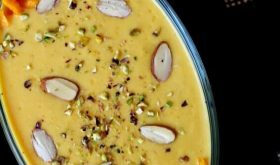 There are two methods to prepare mango faluda. 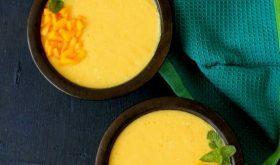 One method involves the use of mango jelly cubes and mango custard while the other method involves the use of fresh mango puree and reduced milk or rabri. I have followed the latter method which I found simpler. I am sharing the easy mango falooda recipe where everything is made from scratch except mango ice cream which is store bought. I have also blogged homemade mango ice cream recipe earlier. So if you are looking at making the ice cream at home, do follow that no fail recipe. Recipe of mango faluda is extremely easy to make from scratch at home. The falooda ingredients include chilled sweetened reduced milk, falooda sev, bloomed basil or sabja seeds, sweetened mango puree, mango ice cream and chopped nuts. I have already posted how to make falooda sev or falooda vermicelli at home as well as the authentic falooda recipe. You can use store bought falooda sev too. The process I follow to make falooda at home is to soak the basil seeds first and then put the milk to boil. While the milk is simmering away, I prepare falooda sev and refrigerate it. Then I make the sweetened mango puree, refrigerate it and chop the nuts. I bring the milk to room temperature by place it in a bowl of water before refrigerating it. I also refrigerate the falooda glasses before layering the mango falooda in them. 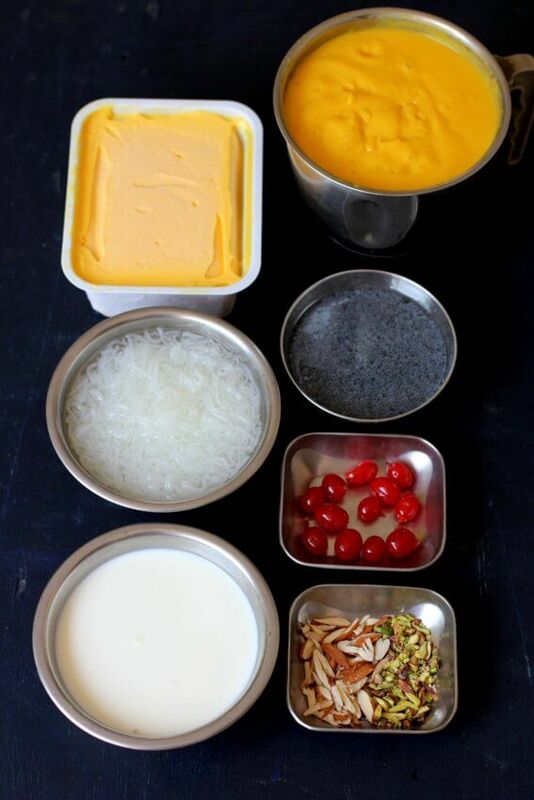 The entire preparation work including refrigeration and layering the chilled mango faluda takes me nearly 90 minutes. 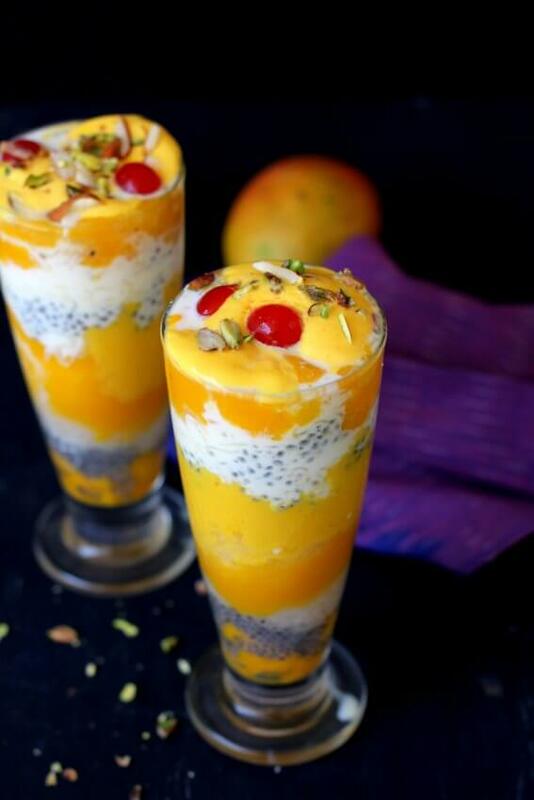 Nothing to beat the flavor of homemade mango falooda. 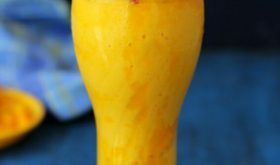 Refreshing, delicious and comforting mango dessert in a glass! Bring the milk to a boil and simmer till it reduces to 1 cup. Turn off heat, add 2 tbsps sugar and mix well. Bring to room temperature and chill until use. Soak falooda seeds in water for 15 to 20 mins and allow to bloom. Set aside. Blend mango puree with 3 tbsps of sugar and refrigerate until use. Make falooda sev by following the link provided above. Place the prepared sev in cold water and refrigerate until use. Chill the serving falooda glasses in the fridge for at least half an hour. 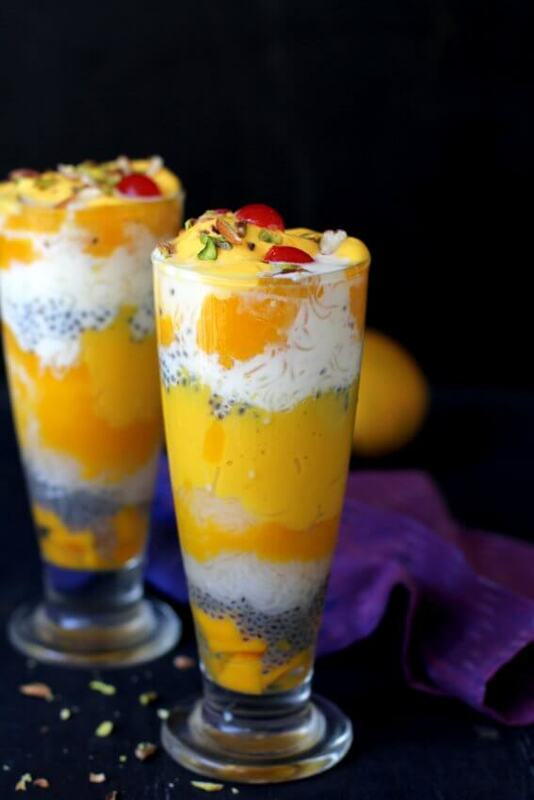 To assemble falooda: Take the chilled serving glass and add few mango cubes in the bottom of the glass followed by 2 tbsps of bloomed falooda seeds. Next layer with 2 heaped tbsps of falooda sev/noodles followed by 3 tbsps of mango puree. Slowly pour few tbsps of chilled milk. Next layer with few more mango cubes, followed by a generous tbsp of bloomed falooda seeds. Next layer with 2 tbsps of falooda noodles followed by 3 tbsps of mango puree and chilled milk. Finally, place a scoop of mango ice cream on top. Garnish with sliced nuts and a cherry. Serve immediately to avoid the ice cream from melting and over flowing. The amount of sugar used in the milk and mango puree can be adjusted according to the desired sweetness. The quantity of ingredients used in layering the falooda is based on the size of falooda glass. Adjust the amount of ingredients used according to the size of the glass.